I am forwarding another letter of support -- from a Catholic who sees your art as faithful. I read your new quotes in the Irish Examiner. You are doing a great job! What little I can see of your work online (which I first encountered PZ Myers' blog "Pharyngula") is gorgeous! I can only see reverence for women and Mary. I'm sorry that so many people feel Mary's body, or any woman's body, is something blasphemous or shameful. I got some of my friends to write letters of support for your Irish exhibit. I am forwarding a copy of a wonderful email "Truth isn't blasphemy!" that Trudie Barreras send to University College Cork. I join Kittredge Cherry, author of Art That Dares and other courageous and innovative spiritual works, in urging you not to surrender to the insistence of the reactionary elements of the Catholic Church in canceling the proposed presentation of Alma Lopez and her splendid work. Far from seeing blasphemy in the work that Ms. Lopez and others present, I see a deeper and -- yes, PURER -- understanding of the meaning of Mary as the mother of GOD MADE HUMAN. 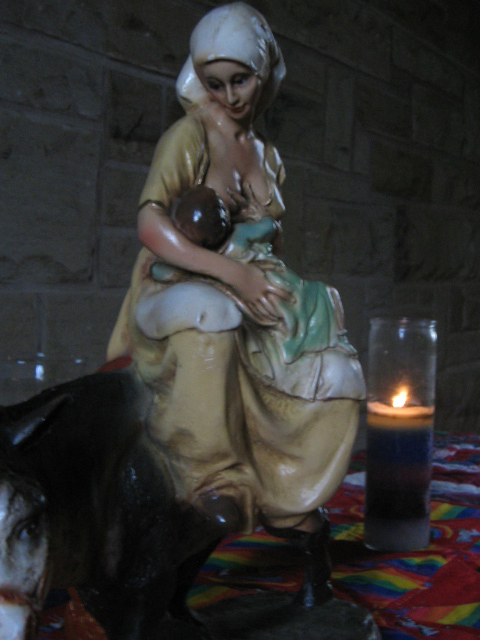 When visiting in Mexico ten years ago, I acquired a small statuette at a "Nativity Market" of Mary nursing the Infant Jesus while riding a donkey, obviously depicting the flight into Egypt. I was deeply moved by this statue, and have titled Her "Our Lady of Travels to Life with Reality". I will attach a photograph of it here. I mention this to point out that some reactionary member of my own church congregation, when I attempted to share this icon, was "scandalized" and insisted on covering Mary with a poncho made out of tissue. This is the same level of total misunderstanding of the reality of who God is and of God's presence in human history through Jesus that the "conservatives" challenging your presentation demonstrate. I pray that you will not surrender to their own blasphemous denial that God truly loves ALL humankind, and that the reality of God's presence amongst us far exceeds the stilted and fantasized ideas of "purity" that they are so obsessive about. There are those who create art to mimic their emotion, the Most Blessed and Holy Virgin Mary whether or not you believe in Her is Our Mother. Please re-consider what you are doing this your talent. Your gift of Art is not something that You developed or self taught yourself. It is in fact a Gift from God and to be used in such a way that would help others find the road to Heaven. Please search your soul and retract this picture from your portfolio. Satan has enough power and ugliness in this world already, please do not add your eternal soul to his list of names that will forever burn in pain and unhappiness. I thank you for reading this and prayers will be offered tonight for you at our Rosary Group. May God have Mercy on our world. Greetings from Ireland. If nothing else, the church is getting your name out there and giving some publicity, I wouldn't have heard about this exhibition were it not for the controversy! Unfortunately, I'm 200 miles from Cork, and don't think I'll make the exhibition since I only heard of it today, otherwise I would have been there in a flash. I love the image. I think it is a beautiful and strong female image. Disregard the negative commentary! I grew up in an extremely Catholic family, but consider my sense of spirituality to be housed well outside the "machine" facade of organised religion. The more you see how women are ostracised from active inclusion in religion, and the editing out of certain bibles deemed unfit, and the almost non existent knowledge of Asherah (whom I only recently discovered myself), it really opens your eyes to the "organisation". I am a theatre practitioner here, and have so many questions and conflicts within myself about religion, but the concept of the universal Mother, be it Mother Earth, Mother Nature etc is nurturing and comforting. I hope to develop some work around these issues in the future. Below is the link to a blog with some interesting comments that I found today, so having seen your website and your request for any articles I thought I would send this to you, though you may already have it. I hope the exhibition goes ahead. Thanks for making these wonderful and empowering sacred images. I think it is wonderful that your university is hosting “Our Lady and Other Queer Santas” by Latina lesbian artist Alma Lopez. I am a Unitarian and a Wiccan, and a fan of JesusInLove.org, which supports LGBT spirituality and the arts. Thank you for showing the work of this brave artist who is re-envisioning the sacred in life-giving ways. Queer sacred images are needed now because conservatives are using religious rhetoric to justify discrimination against lesbian, gay, bisexual and transgender (LGBT) people. The split between sexuality and spirituality really needs healing, because it is life-denying - and Lopez is healing that divide. It’s important to imagine sacred figures in new and different ways because it empowers people to grow in their relationship with each other and with the Divine. “Our Lady and Other Queer Santas” is a sacred event that affirms LGBT Christians and other LGBT people of faith. In the name of religious and artistic freedom, please do not give in to critics who want you to cancel these events. christians because She was manifestly pregnant in this apparition. God'. On one such ritual day, 40,000 were murdered in this manner. million persons came to profess the Name of Jesus in 8 years. is protected from the moment of conception - the moment of ensoulment. I am most disappointed that the Chicano Conference in UCC this week is being permitted to include events that are blatently insulting to the people of Ireland and to the Catholic Faith, which is still the faith of the majority of Irish people. I refer to the "art" exhibition entitled: "Our Lady and Other Queer Santas", as well as a book signing by Alma Lopez. While I believe that foreign students should be welcome in Ireland, and should be free to celebrate their own culture, they most definitely should not be welcome to or permitted to insult this country, its people and the religion that the majority of its people practice. The above mentioned events are blasphemous, which probably makes them illegal. Although the present government intends to remove our blasphemy laws, they are still in force at this time. And whatever about their legal status, these events are not welcome in Ireland. As far as I know, UCC is mainly funded by Irish people through taxes. I find it entirely unacceptable that the college should facillitate foreign students in insulting what is dear to its benefactors. Finally, to hold a blasphemous exhibition in the O'Rahilly building is an insult to the memory of the great Alfred O'Rahilly, who would never have allowed such an offensive exhibition in UCC. My alma mater fills me with dismay. The connection between destructive embryo research now taking place at UCC and the blasphemous representation of Our Lady of Guadalupe on display in the O'Rahilly building is telling. The black sash on this traditional image of Our Lady represents that she is with Child. Ill-treating the sacred in these ways does not bode well. May God have mercy on all involved. I just wanted to offer my support for what is obviously a difficult week for Hispanic Studies. I have a margin of an idea of what you are going through as I am recieving a lot of calls this week from so called "christians" in relation to the exhibition. The reason I am getting the calls is because when you type UCC into google the Visitors' Centre is the first phone number that comes up. I just wanted to say I emphatise with what you are going through as the volume of nasty calls we have had this week I am sure is only dwarfed by calls your own department is recieving..